READ THE BLOG oh yeah, we also won an award! Jamestown Colorado was one of the hardest hit towns during the September 2013 floods; the small town of 300 lost 20 of the roads, both of their bridges, the water plant and the fire station. WORKSHOP8 worked closely with Jamestown to develop their concept design into a building reflective of both the community and the resiliency of the town. The final design includes a 4-truck bay garage, office space and storage space above. The former brass fire pole was incorporated as a detail paying homage to the past. The JVFD Fire Chief, Arne Metzger, and WORKSHOP8 Project Manager, Emily Axtman, came up with the idea for the checker board concept in the upstairs community room. WORKSHOP8 gifted the JVFD a set of giant checkers as a firehouse-warming gift. WORKSHOP8 partnered with Faurot Construction, JVA, and Boulder Engineering under a Design/Build fast-track contract for this project. Faurot Construction used an innovative composite concrete wall system similar to Thermomass. JVA has designed the site so that water will properly drain around the building to the southeast, with a series of gabion walls on the northwestern edge which will block a large amount of future flooding from even entering the site. This award winning project now stands as a beacon upon arriving in Jamestown with a red hot roof and shiny new metal siding. 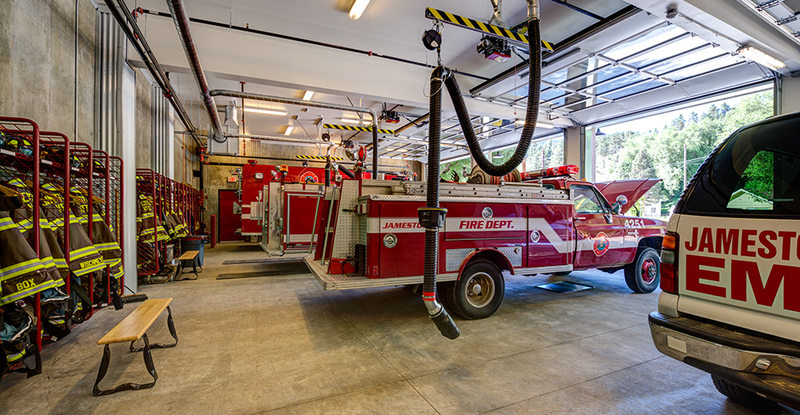 It has become so much more than a fire station; it symbolizes the spirit of the people of Jamestown and is a harbinger of all of the rebuilding that is yet to come as they continue to recover from the flood that devastated the town in 2013.